Call on us for kitchen renovations that are sure to please. One of the most common home renovations in the Cornelius, North Carolina area is kitchen renovations. If you have a kitchen that needs updating to increase the value of your home and your enjoyment, give us a call at Chad Goodin Signature Homes. 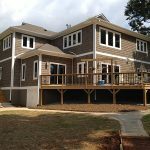 Not only are we the premier builder in the area, but we also handle all your home renovations with the same attention to detail and exemplary customer services. Since 1999, we have provided our customers with almost unlimited options and possibilities during kitchen renovations. We’ve developed countless relationships with material providers and compiled a team that settles for nothing less than high-quality work and your 100% satisfaction. As a full-service contractor, we are equipped to handle everything from minor changes to layout changes. We can even handle a large project such as if you are looking to enlarge your kitchen with a home addition. We take the extra time needed in the planning stage to be sure you are completely ready to proceed and happy with the kitchen renovations down to the finest detail. We stay in touch throughout the project so you can be confident that everything is going as planned. You’ll always know what to expect at each phase of your kitchen renovations. From our exemplary design services to our superior workmanship and disciplined project management, your kitchen renovation experience will be pleasant and fun, as it should be. If you have any questions or want to get started, give us a call. We’ll be happy to set up an initial consultation and get you on the road to your dream kitchen. At Chad Goodin Signature Homes, we proudly perform kitchen renovations in Mooresville, Cornelius, Davidson, Huntersville and the surrounding Lake Norman area of North Carolina.